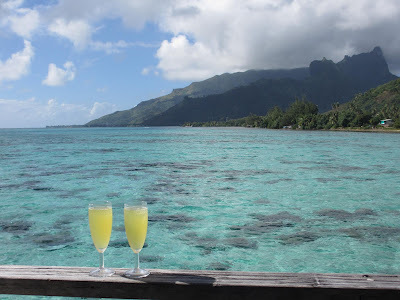 I’ve been jotting down things as I remember on my ”list of things I wish I had known” before we went on our Honeymoon and thought I would share for those that are also thinking about making a trip to the beautiful French Polynesia. If you take the night flight into Tahiti, I would suggest getting a basic/non-bungalow room. You land in the dark and Tahiti isn’t anywhere near as pretty as the other islands so it’s not worth the splurge. We took a taxi to the Papeete (Papeete is the capital of French Polynesia) market before our ferry over to Moorea and spent a few hours walking around the downtown area. There’s basically no shopping on Moorea or Bora Bora so if you want to purchase anything Tahiti’s your best bet. I was a little leery about getting my black pearls at the first place/first morning but don’t regret it at all after seeing the shops at the Hilton s and the few scattered everywhere else. I got my pearls at the Tahiti Pearl Market. We actually got to pick the pearls and the settings and then came back 30 minutes later and they had set them. We started the whole process in April and it was major crunch time to get everything completed. You do have the option of having your final check off dives at your vacation destination (if it’s offered) but that eats into your actual “dive” time and you can run into the language barrier with that option too. We did everything through Choo Choo Dive in Chattanooga. I have nothing but good things to say about this place – everyone we met and worked with there is on top of their game. We first did the Intro to Scuba class where you receive an explanation of the equipment, sign all the waivers and then get in the pool with the equipment (just the shallow end). After that, we signed up for the classes (Open Water Diver). We went with the intense weekend course that was Friday evening and all day Saturday and Sunday. Plus an additional Thursday evening to get a nitrox certification. Once you finish the classes you have to have 5 certification dives in order to be open water certified. We did that at the rock quarry in Athens and it was FREEZING. They do take weekend trips to Florida in the spring but with our timing we couldn’t fit it in. Once we were on the honeymoon, we dove with Top Dive. Adam had pre-paid for the diving before we left (you get a slight discount) and can email with them etc to get any questions answered up front. They have locations throughout the Polynesia but we decided to only dive Bora Bora. We had 2 dives – first one we saw sharks and the second, spotted eagle rays. You don’t go far in the ocean at all so motion sickness wasn’t an issue. You do have to plan your diving around when your flights are because you have to allow a certain amount of time to pass before you can safely fly. Top Dive picked us up from our resort dock and returned us afterwards. We did buy/take most of our equipment with us. The only things we rented were ours BCs and tanks. (Be prepared to spend a lot of money on diving equipment!!!! I’m still in sticker shock but it’s like any other hobby/sport.. you can buy all levels of equipment with or without the bells and whistles). No type of heels/pumps whatsoever. I wore the same sandals basically everyday/every meal/everywhere. There’s sand everywhere and LOTS of walking involved (from the bungalows to the main resorts can take 10-15 minutes by foot). Leave anything perfume/lotion/scented home! Bring plenty of bug spray and itch cream! Let’s just say I learned the hard way! If you are taking dive equipment, pack it in its own bag and don’t pack your diver certification cards—keep them in your purse/carry-on etc. This saved us many times with not having to pay overweight fees… bat your eyes and say but we have dive equipment and then flash your cards!! Men don’t need anything more than dressy looking shorts. Adam took several pair of dress slacks and maybe wore one pair? It was really too hot and khaki shorts seemed to be the norm/acceptable. We booked our own flight from Atlanta to LA and then our other flights were part of our package through the travel agency. You just have to allow at least 4 hours between when you land and then take off so you can claim your bags, check in, re-check bags, go through security, customs, etc. There’s only 2 flights a day into Tahiti so you don’t want to miss your flight!!! When flying into Bora Bora be on the left side of the plane (you enter from the back, sit on the left so main aisle is to your right). They are very strict about the baggage (weight/size) restrictions on the Air Tahiti airline. We triple-checked everything before each flight!! A can of pop is $5. The Diet Coke tasted weird and the last day I discovered the Coke Zero was really more like Diet Coke. We converted about $250 when we got to the airport in Tahiti. When we got back to the states we converted back and had about $40 left. For the majority of costs you can charge them. Very little need for a lot of cash. I always use my Capital One card for international travel because they’re one of the only credit cards (that I’m aware of anyway) that doesn’t charge an international fee per charge. When you’re at Moorea, lots of local restaurants will come pick you up/drop you back off for dinner. There’s only 1 place to get dinner at the Hilton Resort in Moorea so it was nice to have options. We had an amazing dinner at Rudy’s. When you’re in Bora Bora… there’s nothing other than the resort. HOWEVER --- we had lunch at Bloody Mary’s on the “main land” and it was well worth the boat taxi fee. You’d probably enjoy the dinner there too but we aren’t sea food people so lunch was just fine with us (best burger ever). Either way – lunch or dinner – it’s something you HAVE to do while you’re there. We did 4x4 jeep safari excursions on both Moorea and Bora Bora. The one on Moorea went through the fruit plantations and by the juice factory (buy pineapple juice – it’s so good!! We mixed it with champagne and had mimosas in our bungalow). The one in Bora Bora was a last minute decision and I’m so glad we decided too. We got to see the mainland and some gorgeous views of the lagoons. It’s very humbling to see how the people live on the island – especially when you compare it to the glamour of the resorts. 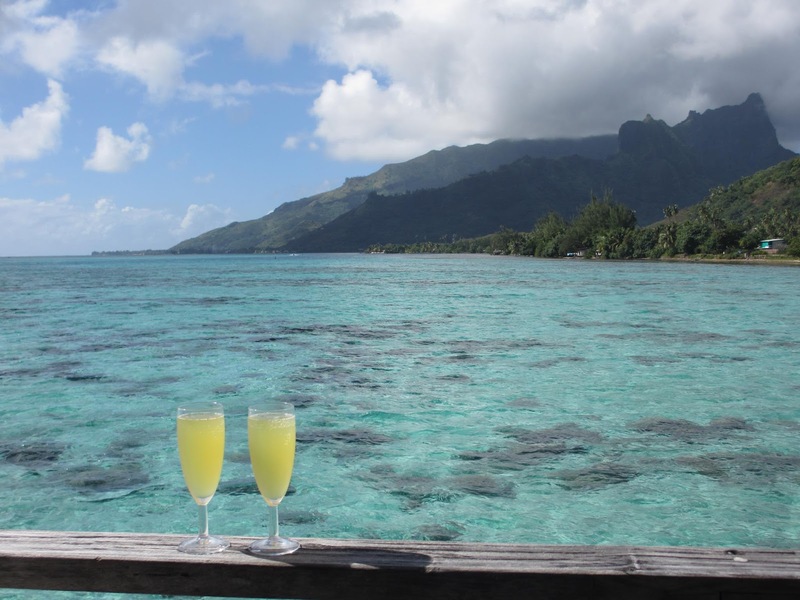 We stayed at both Hilton resorts (Moorea and Bora Bora) and they were fabulous. We met another couple in Moorea at our resort that went on to stay at the Four Seasons in Bora Bora vs the Hilton. I felt like I knew what I was getting staying at the Hilton – BUT – I may have possibly booked at the Four Seasons instead after seeing some of her pictures. If you stay at the Hilton in Bora Bora, you have to go up to the spa (massage was awesome) but even if you don’t get a massage, the spa is famous for the million dollar views. Absolutely beautiful!! Make sure you ask when you book and when you check in for a bungalow that’s as far out as possible and facing away from the other bungalows. Here’s the company/agent we used to book. She’s a little ding-batty but has been to the islands a few times and knew about the resorts, etc.